I like authorized biographies. We get spin and opinion from journalists all the time when analyzing a leader’s record, and often those journalists are judging from the outside what a leader is thinking. Here we have a writer who has a bit of access and can ask straightforward questions and get reasons for why a leader would choose one path over another. There may be some self-serving spin on the leader’s part, but many times the outcomes of decisions are not immediately known—it takes some time for them to play out in the European theatre—so we are looking at decision-making and rationale. Those are useful in judging the record of a leader. Kornelius knew Merkel since she got her first political job as spokesperson for the East German Democratic Awakening Party in 1989, before it was eventually absorbed into the West German Christian Democratic Union (CDU). He reports on foreign policy for the Süddeutsche Zeitung. This authorized biography felt constrained and thin to this outsider at the start when we are unsure whether or not to trust the author’s perceptions. 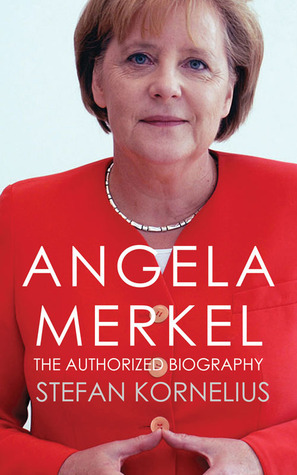 After Merkel’s election as Chancellor in 2005, however, Kornelius uses his experience watching events in Europe to sketch dynamic relationships as they unfolded, adding government rationale and commentary on public reactions. Many of the relationships and people discussed in this 2013 book are still in office, making it absolutely relevant. It is commonly held opinion that years of crisis are good years for chancellors. Merkel’s first term saw the bankruptcy of Lehman Brothers the year before the general election, and from then on her main preoccupation would be the economy, the stability of the banks, the survival of a single currency, and a whole range of political issues that went with the euro crisis. Merkel’s approach to saving the banking system (tighten money supply) appeared to be opposite to what the Americans wanted to do (loosen money supply), and in fact there was a moment when Obama’s financial policy team led by then-U.S. Treasury Secretary Geithner almost derailed Merkel’s attempt to orchestrate a response to the Greek debt crisis. Merkel believes in American exceptionalism, and firmly believes in the necessity for the U.S. to involve itself redressing imbalances in the world power structure: she finds the notion of Russian or Chinese overreach troubling because their autocratic systems are not as free. However, she did not go along with the intervention in Libya (Germany abstained from the U.N. vote) because she “viewed the rebel movement in Libya and the rest of the Arab world with skepticism…She thought the political currents in these countries gave no clear indication of their likely future character as states.” Kornelius calls this decision one of the worst foreign policy blunders in her career. I wonder what he would say now, when in America the decision to intervene in Libya, urged by Hillary Clinton, is now considered one of the most ill-considered decisions of Obama’s two terms. A discussion of Merkel’s relationship with Putin reveals a refusal to be bullied, each by the other. It is a relationship of uneasy balance, and wary distrust. Merkel had hopes for a Medvedev government, only to have her hopes collapse at the handover back to Putin. Merkel opposed Ukraine and Georgia being a part of NATO early in her chancellorship, despite heavy lobbying by the George W. Bush administration. She could see weakness in the governments there, unresolved conflict, and a fiscally-tied closeness to the Russian regime that spelled future trouble. The decision to refuse NATO status to Georgia under Saakachvili turned out to be a good one since three months later Saakachvili was testing Russian mettle and being soundly beaten for it. At the top of Merkel’s scale of values is freedom… “Freedom is the joy of achievement, the flourishing of the individual, the celebration of difference, the rejection of mediocrity, personal responsibility.” …Now, after over seven years as Chancellor, freedom is more than ever the leitmotiv if her foreign policy. The debt crisis in Europe tested not only the financial structures but the political ones as well. It called into question the nature of the European union. One possibility was for the EU to become, in essence, a United States of Europe, or a European superstate where power is transferred to Brussels. Another possibility was a union that worked in parallel with the EU, where states keep existing treaties and conclude new ones with each other and solve problems (labor laws, tax laws, budgets, social security) though intergovernmental solutions. Merkel believed it better for individual states to retain their sovereignty and coordinate with others. The social models and national sensitivities in member states were too different to allow for a single solution in these areas. But Merkel still firmly believes that globalization will sweep away individual states unless there is a new European economic order that allows Europe is to get “big” enough as a bloc to be able to compete with other huge economies. Her suggestion that there be more unity and control within the EU involved a new system of economic supervision, a Council, which would be a chamber to advise on and structure a program of individual state economic reform with heads of government. It is an ambitious suggestion that perhaps only someone like Merkel would make, with her step-by-step solution to problems. The Transatlantic Trade and Investment Partnership (TIIP) with the United States currently under scrutiny once again is another thing Merkel has been keen to finalize, despite hot debate in Germany. “Globalization” is a concept that was begun in the 1990’s and its efficacies have been called into question during the 2016 election in the United States. Merkel's solutions for addressing weaknesses in Europe's position vis-à-vis a program of globalization may be enough to keep the system from being swept away wholesale, but it is clear she needs the stabilization of powerful economies like Britain to keep the system stable, to say nothing of her firm belief that cooperation will be more beneficial than each country trying to stand alone. Merkel’s low key style does not highlight the important place Germany has assumed in the years since she became Chancellor. The turmoil surrounding the Syrian migrant crisis was not addressed in this book but is sure to be part of Merkel’s legacy. Merkel has said that she does not want another term, though there are no term limits on chancellorships and her predecessors often stayed for up to 16 years. It is always hard to imagine who could follow a figure who has assumed such stature. Kornelius did a good job covering a lot of ground. His book is just one of many needed to get a grip on the wide range of topics covered in this book. A lot happens in ten years and Kornelius wisely limited his scope to the crises in Europe which were in the forefront. I expect we will have many more detailed portraits of Merkel's time in office to come. Translated by Anthea Bell and Christopher Moncrieff under aegis of the Goethe Institute, this work was originally published in German by Hoffman and Campe Verlag in 2013. This translation, based on a revised German text including the additional chapter "The British Problem," was first published by Alma Books Limited in 2013. The book is also available as an eBook.